So I moved back to Edinburgh a few months ago, and was staying with a family friend for a while before I found a room to rent in a flat. I moved in at the start of January, but it's taken several weeks to move up most of my belonging from my parents' house, as my mum has been bringing it in small batches, since I rarely take a day off work. It's a slightly strange room still to be honest, as it's far less personalised than most places I've lived over the past few years. I think because I've moved so many times in the last couple years, I've stopped 'settling' as much into each new place, since I know I'll be moving out again sooner or later, and I'm so tired of packing everything up all the time - it's easier if there's less stuff! So while most of the belonging I use regularly are with me in this flat now, the majority of my things are still at my parents. 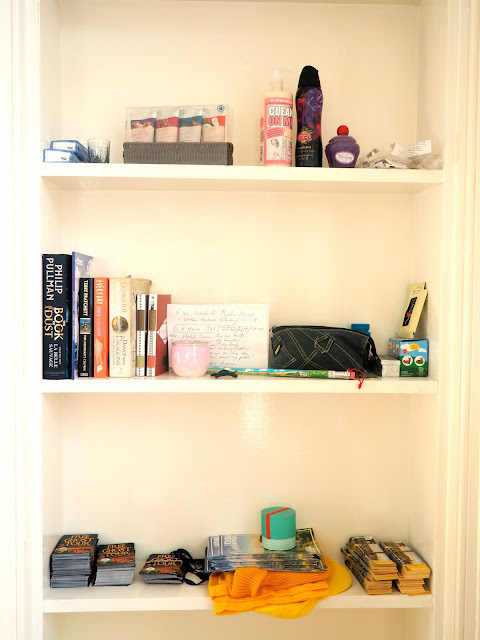 The room is more personalised now than when I first moved in, which is why I'm now doing this room tour post, but compared to likes of my student flat during my final year, it still has far less of my style and my things. 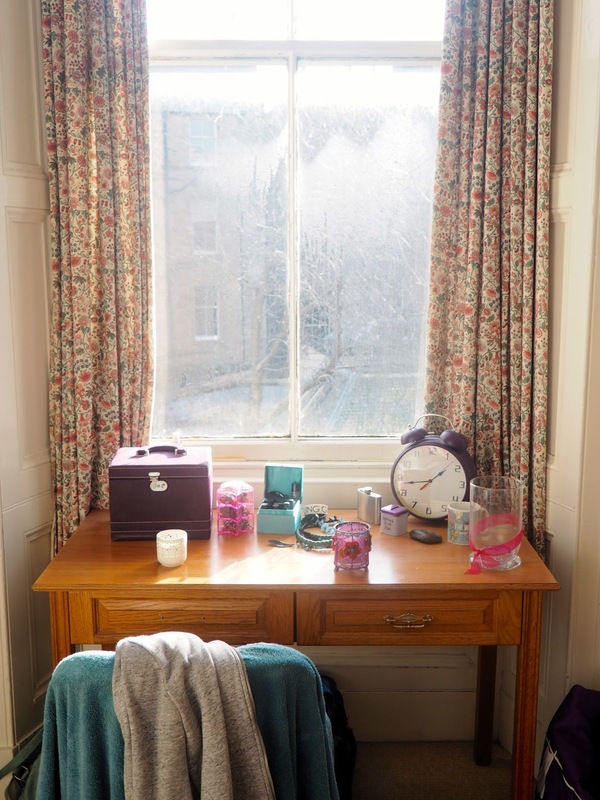 This is also the first time I've lived with flatmates in a couple of years, as I've mainly been in studio flats, and especially so many of them, as this is a five bedroom flat (though only four of us live here full time), located in the Marchmont area of Edinburgh. It's ideal for work, as it's only a twenty minute walk to the Royal Mile, though I often go days at a time without seeing my flatmates, as most of them work or go to university through the day, while the majority of my shifts are in the evenings. As well as my room, there's our shared kitchen, small living room, bathroom and hallway, which aren't pictured. My room faces the back of the building, which is good, as I'm away from any potential noise from the street or the student halls across the road. It's an old building, so there's high ceiling and tall windows, and since my room faces south, there's loads of natural light through the day, so I rarely need to turn the lights on until it gets dark in the evenings - also ideal for my outfit photos! The furniture all came with the room, and there's enough items to store all my stuff, although some of it could use updating - I've got two drawers missing handles, and others that are a bit wonky! I haven't brought up most of my posters, frames, and other wall art so far - as I said, I've been a bit lazy about decorating the room at the moment, and they aren't the easiest items to transport - but I did eventually fill up the pin board just inside the door last week. The centre piece is actually the dust jacket from 'Turtles All the Way Down', by John Green, which unfolds into a quotation poster on the inside. The other items include Fringe flyers, postcards, Chinese New Year red packets, tickets and wristbands, and other cards and prints I had lying around. Next to that is the mirror, so I've used the chest of drawers to put all my hair, makeup, and other cosmetic items. I didn't try to tidy this up much for these photos, as I think the internet has enough 'picture perfect' rooms as is; this is more authentic, as I use this stuff everyday and don't actively try to keep it neat. The drawers and wardrobe have all my clothes in them, and I like that the wardrobe has a second mirror, which is better for viewing outfits in full. In previous flats, I've hung my own curtains that match the bedding, and are a little nicer than these, but I've just been totally lazy about it this time - it's not something that bothers me enough to want to change them anytime soon, and it's a lot of effort! I never actually use the desk for any sort of work - I used to in my student flat, but the closest I come to work at home now is blogging, which I tend to do on the bed. Instead, the desk holds some of my more personal items, including all my jewellery, this big clock that I've always loved having around, and a few other trinkets - there's also always mugs scattered around my room, often waiting to be washed, though this one has never actually made it to the kitchen and been used yet. I like having candles around too, especially in the evenings, and the two smaller ones here, plus the other on the bedside table (below) are usually for tea lights, while the big, empty vase will eventually be used for a larger, scented candle again, as soon as I get round to buying one! I really like the shelves built into the corner of the room, as I can store stuff on them that also looks nice to have displayed. The books are an obvious choice of course (though I don't have nearly so many around as when I was a literature student! ), as well as various bits of stationary and some spare toiletries in sort of pretty bottles. The third shelf down is all my work stuff, including tour tickets, flyers, and my lanyard, so it's all easily accessible, and the large Jaffa Cake tube on the bottom is actually empty, but I haven't thrown it out yet. I hung this tote bag on a spare hook, partly as a handy place to store it, and partly because I thought it looked kind of cool as a wall hanging, with the text on it. 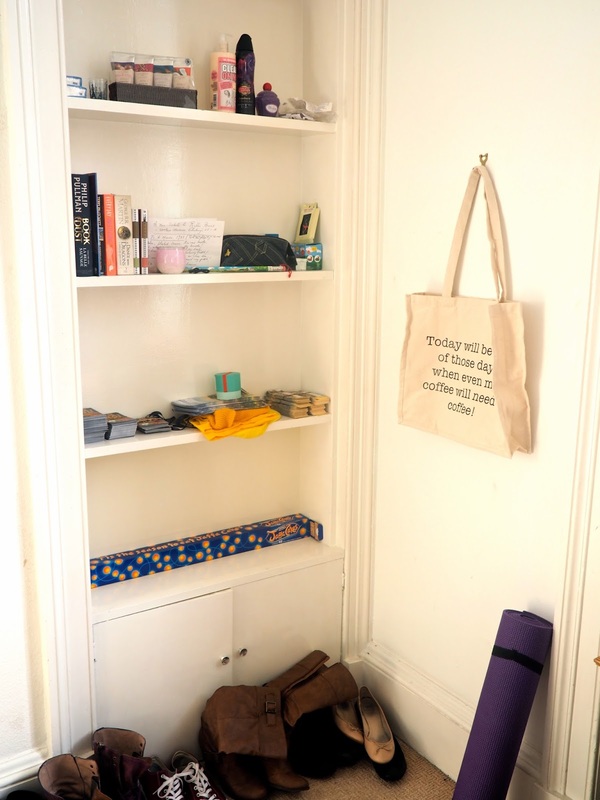 My yoga mat also lives in this corner - and it's a room with plenty of space to practice, unlike my Asian flats! - and this is the emptiest space along a wall in the room, so all my shoes are lined up against it, stretching from the shelves to the bedside table. I'm so happy to have a double bed again, after singles only in Asia, and I've got my old bedding back on it, as I still really like how bright and cheery it makes the room. There's a big lamp beside the bed, which is nice for lighting in the evenings, alongside the candles (another of which is on the bedside table), and I also keep a 'One Line a Day' 5 year journal that I recently started on the bedside table too. There's a second table at the foot of the bed, but this is normally where I dump mugs and plates until I take them back to the kitchen, so I didn't bother photographing that! And my coats hang on the back of the door, also at the end of the bed. And that's about it! It's perhaps not my most personalised, photogenic room to date, but I thought I'd share it anyway, for an authentic look at my room. Most bedrooms aren't super photogenic all the time, as people actually live in them and have things to do - I'm definitely not the most neat and tidy person at all times, so why pretend I am for the sake of some photos? 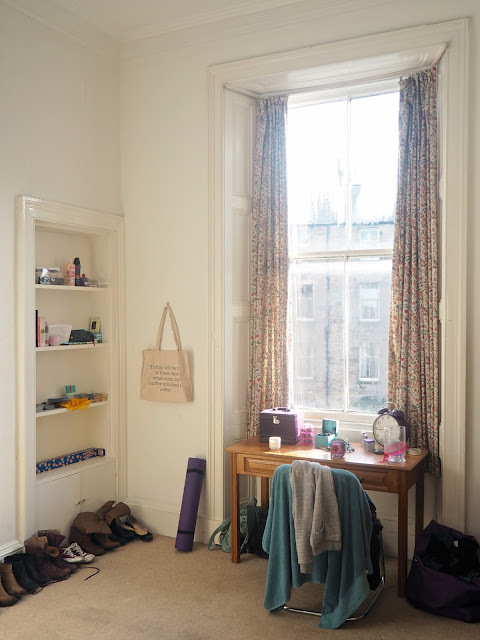 And while I do enjoy having decorated, personalised rooms, I'm so fed up of packing and unpacking every time I move, can you blame me for being a bit lazy and simplifying the process this time round? Hi to the other lady who is just muddling through life.. im .co.uk... looks like a nice cosy room!